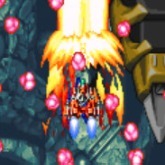 Description: DoDonPachi is an awesome bullet storm arcade game that was very popular in Japan. Choose from 3 anime style air crafts. All with choices of 3 different special weapon types. The levels are insane will bullets flooding the screen. Shoot and drop bombs on all Airplanes in sight. Be sure to collect the floods of stars for extra score. This is actually one of the best arcade shmups ever made. Be sure to show them who's boss and just be ready to dodge every bullet that comes at you. One last thing the bosses are huge and this game has an awesome sound track. Enjoy! Game Controls: Shift Key = In-cert Coin. Enter Key = Start. Arrow Keys = Move. Z Key = Shoot. X Key = Bomb. See In-game Controls for more options.